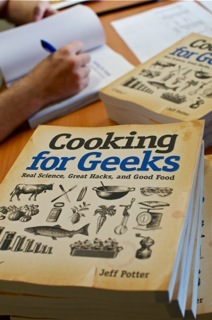 Cooking For Geeks: Are You A Super Taster? (CBS) LOS ANGELES Jeff Potter isn't your typical chef author. The engineer used to cook a lot for friends in his spare time, before deciding to blend both his passions together. The result is a cook book that explores and gives you a greater understanding of the science behind food, while giving you some of Potter's favorite recipes. This is definitely a great gift for any foodie or well... geek.